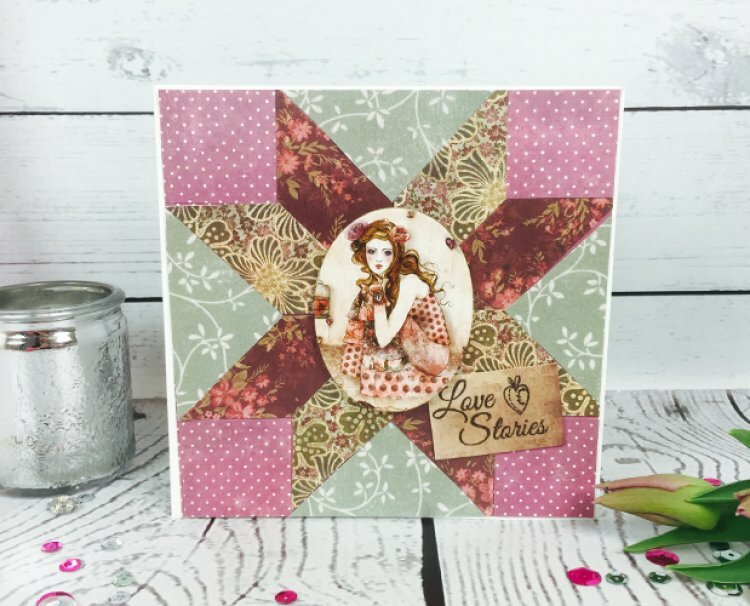 Creating a faux quilting effect on your cards is perfect if you want to use contrasting patterns and colours to create unique designs. 1. Download and print your template twice. One will be used as a guide and the other will be used to cut the shapes and draw around your patterned paper. 2. Once you have cut the shapes out with your chosen papers, we have used the gorgeous SANTORO®’s Willow paper, place them on the patchwork template until you are happy with the design. 3. Stick the patterned paper pieces using double-sided paper onto a piece of coordinating paper rather than straight onto the card. This will hide any slight gaps in the patchwork design. We have cut the coordinating paper by 15cm x 15cm. Once complete, stick your patchwork design to the white card blank. 4. Add text to your card by stamping the ‘Love Stories’ sentiment stamp onto a contrasting piece of paper and cut to size. Once dry, stick to the bottom right of your card at an angle using 3D foam squares. To finish, we have placed the SANTORO®’s Willow character topper to the centre of the card. We have picked the ‘My Love Stories Hearts’ character to compliment the SANTORO®’s Willow papers used. We also made this card to inspire your patchwork card creations. We think these cards would be great to make for people who love sewing crafts. Remember to upload and share your patchwork projects to the gallery.